2016 Chevrolet Camaro Pros and Cons: Why (Not) This Car? Few things are more American than stuffing a big V8 engine into a sporty 2+2 coupe and pricing it for the masses. In Europe, powerful coupes are reserved for the wealthy. Ford did it first with the 1964 Mustang. Chevolet countered with the Camaro two-and-a-half years later. The two "pony cars" have been battling for supremacy ever since. I lusted after both the Camaro and the Mustang as a teenager in the mid-80s. After some dark times during the 1970s, each (like America itself) had recently rediscovered its mojo. Detroit had figured out how to wring 200 horsepower (wow!) from a V8 engine without running afoul of the EPA. These cars could blast from zero to 60 mph in under eight seconds! Though initially I was captivated by the Camaro's swoopy styling, ultimately I favored the Mustang for its less outlandish appearance and more practical driving position. (Even teenage me found the Camaro of the time overly juvenile.) I didn't buy the Mustang, either, but quite a few people I knew did. Though the Camaro has often been the better-performing car, the Mustang has usually outsold it. From 2003 through 2009 Chevrolet didn't even bother making the Camaro. The Ford started with a huge lead, and continues to have a broader, more fanatical fan base. My mother still recalls when the Mustang hit the streets. She's never given a thought to the Camaro. The world has changed a great deal since the 1980s, much less the 1960s. But the Mustang and Camaro are not only still with us, but have been completely redesigned, the Ford for 2015, the Chevrolet for 2016. I reviewed the latest Mustang last year, pitting it against a much pricier V8-powered German coupe to find out if Detroit really does provide similar performance for far less money. Now that the new Chevrolet has arrived, it's time to reconsider the big 50-year-old question: why buy a Camaro instead of a Mustang? Austere, all-business interior. Good headroom and legroom, but feels tight. Why the 2016 Chevrolet Camaro? The Mustang is based on a platform engineered for the Mustang. The latest Camaro is based on a platform engineered for the Cadillac ATS and CTS, sedans that beat BMW at its own game. So it should come as little surprise that, as in the 1980s, the Camaro handles better than the Mustang. The Camaro, in contrast, feels better the harder you push it, body motions tightly controlled, no sense of the two ends doing different things, front end eager to dive in and clip the apex (inside of the curve), rear end willing and able to serve up progressive oversteer at the request of your right foot, center of rotation spot on beneath your seat, steering (in track mode) well-weighted and communicating what's going on at the front contact patches, and the whole shebang surprisingly intuitive. It's one of those cars that makes you feel like a better driver (at least as long as the stability control remains active). The new Camaro's chassis could easily handle much more than the SS's 455 horsepower. (Good thing, as the 2017 Camaro range will include a 640-horsepower ZL1.) In a subdivision where the road has been paved but the houses haven't yet been built, I was able to really drive the car hard, the built-in g-meter registering as high as 1.06 through the curves. It felt fantastic. Unfortunately, in my other driving, which included a couple laps around Car and Driver's favorite Michigan road test loop, the Chevrolet's BMW-targeting Cadillac roots showed through. Though not as quiet inside as a Cadillac, the new Camaro similarly feels like it's going about 20 mph slower than it actually is. When operating the car well below its stratospheric potential, I sensed little besides "big car." Unusually small windows (more about these later) contibute to the new Camaro seeming larger and slower than it actually is. Setting the steering to "touring" enhances perceived agility, especially in relatively casual driving, but I usually preferred the weightier, more direct feel of "track." I have been comparing the Camaro SS to the Mustang GT because they're priced similarly. But for buyers with at least another $12,700 on top of the Camaro SS's base price Ford now offers the Mustang in Shelby GT350 form. I recently spent 20 minutes behind the wheel of the GT350 with the $6,500 Track Package (which includes adaptive dampers), and it's a magnificent car. For the first time ever I thoroughly enjoyed driving a Mustang. Its steering and handling felt at least as tight and precise as the Camaro's, but more direct and much more lively, even though I couldn't push the GT350 nearly as hard as I did the Camaro in that future subdivision. Then again, for 2017 the Camaro will be offered with a track-oriented 1LE Package. Perhaps this package will wake the car up in addition to further enhancing its capabilities. With a 455-horsepower, 455-pound-foot 6.2-liter V8, the Camaro SS outmuscles the 435-horsepower, 400-pound-feet Mustang GT, especially if you're not winding the engines near their red lines. In magazine testing of both cars with manual transmissions (which is how I tested them), the Camaro tends to get from a dead stop to 60 mph a few tenths sooner. But even the Ford can get there in well under five seconds. The real difference emerges once over 60 mph, where the Camaro pulls increasingly farther ahead. It's all too easy to top 70 and even 80 before you realize how fast you're going. Especially in the Camaro, an automatic transmission makes the car quicker. While the Ford's optional automatic has six speeds, the Chevrolet's has eight, and shifts much more quickly than a human can. I don't care if the automatic is quicker, though, because the manual provides a more thorough connection with the car and makes driving it much more fun. Both manual shifters require a moderate amount of effort to snick (precisely) from gear to gear, which is perfectly in keeping with the characters of these cars. In the Camaro, the primary sense that acceleration is happening comes from the exhaust. The tested car was fitted with the $895 dual-mode exhaust system. When cruising at a steady speed there's no exhaust noise worth mentioning. The exhaust drone that could prove annoying on long drives in the Chevrolet SS sedan? It's absent in the Camaro. But accelerate in any mode other than "stealth" and the exhaust rumbles then roars as revs climb. Lift off the throttle at high rpm, and the exhaust crackles and pops. It's a classic American V8 soundtrack, but with more refinement than in GM's previous generation V8. I personally prefer the even more refined noises made by the Mustang's DOHC V8, but mine probably isn't the majority opinion. Many reviewers feel the GT's engine is too quiet. You'll hear no such complaints concerning the 526-horsepower (at 7,500 rpm!) 5.2-liter "flat crank" V8 in the Mustang Shelby GT350. Consensus seems to be that it's far and away the best-sounding V8 you can buy in a car with a price tag under a quarter-million. And if you think it sounds amazing up to 7,000 rpm--at which point your ears will tell you it's time to shift--press on. Over 7,000 rpm the V8's scream goes to a whole other level. The simpler, less varied song of the Camaro's V8 doesn't begin to compare. The ZL1's supercharger won't change this, though it will no doubt yield a much quicker car once going fast enough that acceleration isn't traction-limited. Acceleration in the GT350? Only over 100 mph will it pull ahead of the Camaro SS. Perhaps you don't feel the need for the V8's rumble, and only need a very quick car rather than an extremely quick one. 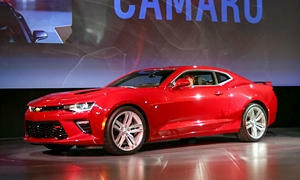 The Camaro is also offered with a 275-horsepower turbocharged 2.0-liter engine and a 335-horsepower 3.6-liter V6. Even the four should be plenty quick for public roads, but its relatively high frequency, refined-four noises aren't the best fit for Camaro duty. When opened up, the V6 emits a throaty roar that better suits the car, and it takes only about a second longer than the V8 to get to 60. These rear fenders can't be easy to form. Wide haunches. Well-designed controls are among the new Camaro's strengths. I'm personally not a big fan of the Camaro's updated styling, which the general public probably cannot distinguish from that of the 2010-2015 car. If anything the designers further amped up the car's steroid use. Though the new exterior appears crisper and somewhat leaner, it also looks even more muscular. While trimming a couple inches off the length, nearly an inch off the width, and an inch off the roof line, the designers also trimmed away the last remaining body fat. If you're seeking a car with bulging muscles, this is your car. While the Mustang took a step in the Camaro's direction with its 2015 redesign, it remains much more restrained and even upscale in comparison. People who'd feel silly in the Camaro will have no such qualms about the Mustang. But the Mustang isn't as cohesive a design. The front clip makes a strong first impression, but the midsection appears somewhat generic and perhaps disproportionately small. 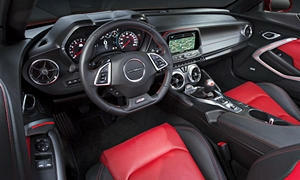 The instrument cluster standard in the Camaro SS and optional with the other two engines includes a reconfigurable display between a large analog speedometer and tach. A five-way switch on the steering wheel makes it easy to switch among different screens on the fly. I frequently toggled between the g-meter and average fuel economy, but there are many other possibilities. An optional (but not on the tested car) head-up display (HUD) would make it possible to monitor both speed and rpm without taking your eyes off the road, which can be very useful when tacking a curvy road or track at a serious pace. Other controls inside the Camaro are also very well designed. The buttons for the driving mode and traction / stability control sit just behind the shfiter. I found it easy to switch driving modes on the fly without looking down to find the button. Physical buttons to adjust the volume and change channels on the audio system are located just ahead of the shifter. In third and fifth there's no need to even remove your palm from the knob to operate them. The physical HVAC controls aren't as well-executed. Temperature and fan speed are adjusted using the bezels of the large center vents. Easy. But the rest of the HVAC functions are managed using a row of indistinguishable smallish buttons. Separate adjustments for the engine sound, steering weight, and (on cars with the $1,695 adaptive dampers) suspension firmness can be made through the infotainment system's touchscreen. This screen places fairly large virtual buttons high enough to see easily and close enouth to reach easily. In general I found the Camaro's MyLink interface much easier to use than the 2015 Mustang's MyFord Touch interface. The 2016 Mustang has an improved interface. But even it won't support Apple CarPlay or Android Auto, which turn the display into an interface for phone-based apps, including navigation. The latest Chevrolet MyLink system supports both. Why Not the 2016 Chevrolet Camaro? Reviwers commonly complained that the 2010-2015 Camaro was so hard to see out of that driver confidence was impaired. In response, Chevrolet's designers made the 2016's windows even smaller and designed the hood over the instruments to bulge up far more than it needs to. While I adapted, in part by raising the seat more than I otherwise would have, in part by stopping well behind the thick white line at traffic lights, I would have enjoyed driving the Camaro much more if it had windows at least as large as those on the Mustang. The windshield in particular is much taller on the Mustang, and I didn't feel nearly as buried within the Ford while driving it. To the rear, the Camaro's broad fenders fill a fair amount of the small side view mirrors. Unfortunately, Chevrolet only offers a blind spot warning system as part of the $5,000 2SS Package. When backing up I heavily relied on the standard rearview camera. While the Mustang's interior also includes some economy-class bits, it's nicer than the Camaro's. Oddly for cars that can take curves at extreme speeds, neither interior includes an "oh-sheesh" handle for the front seat passenger. Clean, yet appropriately menacing. Note how fenders flare. Anyone over 5-6 probably won't fit in the rear seat. Neither rear seat has enough headroom for someone of even my modest (5-9) height. I could scrunch down and ride back there for a little while, but I'd almost rather walk. Getting into and out of the back seat pose additional challenges. If you want a somewhat similar car with an adult-worthy back seat, check out the much larger, much heavier Dodge Challenger. Another fairly obvious "why not to buy," for either car: fuel economy. The tested Camaro scored 16 mpg city and 25 mpg highway in the EPA's tests, slightly better than the Mustang's 15/25. The automatic has an even taller top gear and when paired with it the V8 can deactivate four cylinders, so it manages 17 mpg city, 28 mpg highway--the latter figure as high as that for the Camaro V6 automatic (19/28). For significantly better fuel economy it's necessary to get the 2.0-liter turbo, which scores 21/30 with a manual and 22/31 with an automatic. In my 300-odd miles of driving I averaged 16.5 mpg. If I drove with a light foot I could coax the average slightly over 20. I observed similar real-world numbers in the Mustang. On a 70-mph highway the Camaro averaged 24.5, but there might have been a modest headwind. The Mustang averaged 28 in my highway driving. Overall, both achieve very good fuel efficiency for cars of their weight and horsepower, but praise doesn't come much fainter. The tested Camaro SS was fitted with $1,695 adaptive dampers, which for 2016 are not offered with the other two engines. (They will be available on Camaros with the V6 and the 1LE track package for 2017.) Perhaps owing to these dampers, the Camaro rides surprisingly well for a high-performance car, even in "track." On very bad roads there's some jostling, but no harshness. Even though our local roads are often in a poor state of repair, I generally kept the suspension in track mode. Setting the dampers to "touring" didn't reduce impacts much but did harm body control. I actually preferred the car's ride in track mode. The Mustang GT's ride is also quite livable, but body motions aren't as well controlled as in the Camaro in sport or track mode. Adaptive dampers are optional on the Shelby GT350, but aren't offered on the GT. The Camaro's seats provide merely adequate comfort and support. In hard turns I wished for firmer, more aggressive side bolsters. For the 2017 model year, Recaro seats will be included in the new 1LE package with the V8 and optional with this package and the V6. These will likely be much better than the standard seats. I found the Mustang GT's standard seats more comfortable and supportive. Recaro seats are also offered in the Mustang GT, and standard on the GT350. These fit me very well, but as always with seats your impressions could vary. Neither the Camaro nor the Mustang is as affordable as it used to be, especially not when fitted with a V8 engine. But both remain far less expensive than a European coupe with similar specs. As in the past, the Mustang is less expensive, especially if you compare base prices. The Camaro SS starts $4,000 higher than the Mustang GT, $37,295 vs. $33,295. An argument could be made, though, that the Camaro essentially has the Mustang GT's Performance Package as standard equipment. Adding this package to the Mustang reduces the difference to $1,505. Load both cars up, and they somehow end up much closer in price, Adjust for remaining feature differences, and the Camaro can even end up a little less expensive. In both cars the V8 engine adds thousands to the price, a big change from the early 1980s when a V8 cost as little as $350 extra over a pathetically weak four-cylinder. The Camaro SS has more standard features than the LT. Option up both cars to eliminate feature differences, and the SS lists for $6,365 more than an LT with the 2.0T four-cylinder engine and $4,870 more than an LT with the V6 (which is $1,495 more than the 2.0T). Ford has structured its engine options differently. The base engine is a 300-horsepower V6 with which few options are available. Another $1,500 gets you a 310-horsepower turbocharged 2.3-liter four--but $995 of this goes away if the V6 car is fitted with a package that includes features standard with the "EcoBoost" engine. So they're actually much closer in price than the Camaro LT's two engines. Stepping up from the EcoBoost to the GT adds $6,750. The Mustang's DOHC V8 likely costs more to build than the Camaro's cam-in-block V8, and this is reflected in the GT's price. Though it has been 30 years since I started following this competition, much remains the same. The Chevrolet Camaro remains the quicker, better-handling car. The 2016 Camaro SS can accelerate and corner so quickly (with the sort of chassis hardware usually only available on cars costing far more) that much of its potential must go unrealized on 99 percent of public roads. But the Camaro also remains the car with (to many but not all eyes) overdone, even cartoonish exterior styling, an overly plasticky interior, and severely restricted outward visibility. In comparison, even the Ford Mustang seems a tastefully styled, roomy, and practical car. Since most people can use the extra room and practicality of the Mustang far more often than they can use the additional performance of the Camaro, perhaps it should come as no surprise that the Ford continues to outsell the Chevrolate by a wide margin. Yet this still seems unfair. GM's engineers have delivered an incredible amount of performance, handling, and even refinement for a starting price of $37,295. Don't need the V8? Then the Camaro starts as low as $26,695. If you consider only performance, handling, and price, the Camaro deserves to sell far better. The lesson GM has yet to learn: it doesn't matter how technically outstanding a car is if many potential buyers feel they can't live with it. The 455-horsepower 6.2-liter V8 is beyond overkill for most public roads. Despite the Camaro's huge rear end, both the trunk and its opening are small. Chevrolet and Ford each provided a car with a tank of gas for four and seven days, respectively. 2016 Chevrolet Camaro pros and cons, according to Michael Karesh: the best reasons for buying (or not buying) the 2016 Chevrolet Camaro. Join TrueDelta to post your own impressions. I admit it is hard to get used to, but by properly adjusting the outside mirrors so that the body panels are not visible, things do improve. The rear view camera is a vital necessity however! Agree that the view out the front can be a problem sometimes. The bulge in the hood, which I like from the outside, can get in the way of right front wheel placement while parking. Looks/styling are pretty subjective, and I for one, prefer the Camaro to the Mustang, generally speaking. Good and bad examples can be found of either one. Otherwise, a fair review in my opinion.